Why do I tell you this? Appearances can lead one to think that nothing was out of the ordinary. The reality is that Patrick Colbert, Michael Reddick and their maintenance team, Michael Jenkins, COO, David Scott, Executive Director and Director of Lifelong Learning, Bruce Levy, Temple President, and very dedicated vendors spent extraordinary numbers of hours to make Beth Israel ready for all of us. Now what? In the Torah this week we read about Noah. He’s divinely inspired to prepare for the great flood. He builds an Ark for his family and all the animals that enter it two-by-two. His story ends with a promise from God. The rainbow in the sky, a keshet, is a sign of the covenant God makes with Noah and all humankind that the earth will never again be destroyed by water. Later, commentators warn that though God makes this promise not to destroy the earth by water, it doesn’t preclude the possibility that we might destroy our dwelling places by water or other man-made disasters. Biblical stories are supposed to evoke awe in us. They are meant to be great motivators of human behavior towards the good. Though we’re far from Biblical times and we live in an age of technological awe, we are human beings saddled with the same troubles as Noah. We knew that Hurricane Harvey was coming and that it was coming on strong just like Noah knew that the great flood was imminent. The difference is that Noah did something about it. 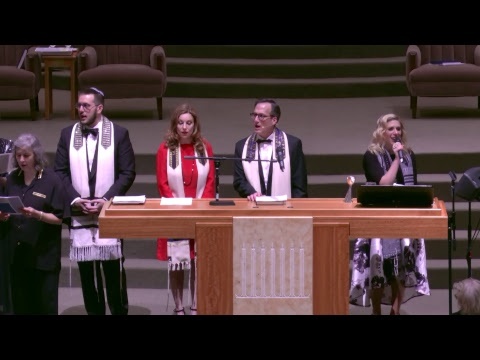 In the Torah lesson, today, we hear a warning to come together as willing partners and fix the problems that flood our neighborhoods across the city. It’s a human covenant we must make with each other that such man-made disasters will be less likely to occur in the future when the storms do rage and the hurricane season does linger. Next High Holy Days, I want us to enjoy the sanctuary and all that it welcomes us to enjoy. I want our congregational families and community to anticipate the hurricane season without trepidation, and I want our community to accept the facts on the ground without looking to heaven for answers from God. The answers have already been given. Barring the building of an Ark, we must prepare for the waters that only humankind can prevent from destroying our lives and livelihoods. Congregation Beth Israel is part of the solution. We will be at the table where questions are asked and decisions are made about our future. Please let us know if you and your family or friends need additional support or help at home. We are with you now and always for the sake of your safety and peace and our future made stronger, together.